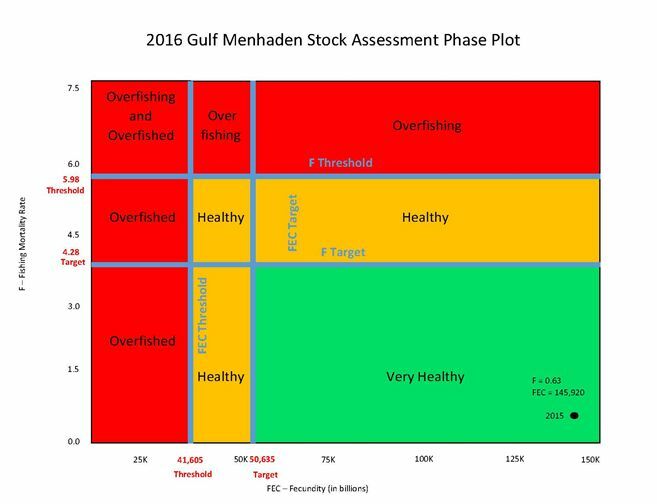 HOUSTON, TX--(Marketwired - October 31, 2016) - A new assessment released by the Gulf States Marine Fisheries Commission (GSMFC) has once again confirmed that Gulf menhaden are neither overfished nor experiencing overfishing. The assessment, an update to the GSMFC's 2013 benchmark assessment, is the latest piece of scientific evidence demonstrating that Gulf menhaden are being sustainably and responsibly managed. "The 2016 update of the Gulf of Mexico menhaden stock assessment is extraordinarily positive," said Peter Himchak, a Senior Fisheries Scientist from Omega Protein. "The probability of the stock experiencing overfishing or becoming depleted is remote." The results of the assessment are an important confirmation that the Gulf menhaden stock has been sustainably harvested and is on a healthy trajectory. With data collected from the most recent years, the GSMFC found that "fishing mortality rates decreased during the 1990s and have remained at a low level through today." This thorough analysis of the Gulf menhaden stock utilized a wide range of sources: these include catch records, port samples, and daily logbooks containing fishing locations. The assessment also included data from two sets of fishery-independent surveys to help determine relative abundance of juvenile and adult menhaden. As a result, there is high confidence in the conclusions and accuracy of the assessment. The results of the assessment are reflected in the graph below, which charts the status of the stock based on current measurements of fishing mortality and fecundity. Because of low fishing mortality and high fecundity, the Gulf menhaden stock is in the "very healthy" range, exceeding the goals set by fishery managers to maintain a healthy population. These findings will guide the management of the Gulf Menhaden stock until the next full assessment is conducted in 2018. "Omega Protein Corporation (NYSE: OME) is a century old nutritional product company that develops, produces and delivers healthy products throughout the world to improve the nutritional integrity of foods, dietary supplements and animal feeds. Omega Protein's mission is to help people lead healthier lives with better nutrition through sustainably sourced ingredients such as highly-refined specialty oils, specialty proteins products and nutraceuticals.